Greer Landscaper - Cochrand Landscape Management, Inc.
We provide services for many surrounding cities and towns, including working as a landscaper in Greer! Todd Cochran, owner of the business, received his B.S. at Clemson University and has over 20 years of experience in the industry. Cochran Landscape is dedicated to serving the needs of all Greer residents, including landscape lighting, and irrigation system design, repair, and maintenance. Within each service, we offer a wide range of materials and styles to fit your preferences. If you need a landscaper, call us today so we can turn your outdoors into a beautiful component of your home! One of South Carolina’s fastest growing cities, it is located in the heart of the state’s bustling Upstate area. The city, home to 25,515, offers beautiful scenery filled with mountains and lakes. Families have found the city’s first-rate services, amazing park facilities and recreation programs, and city amenities while also maintaining a small-town feeling atmosphere. 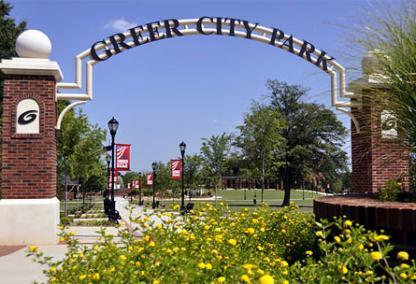 Greer Station, the city’s Central Business District, has become a destination with over 12 blocks of retail, dining, entertainment, and service organizations. A major attraction during the summer season is the “Tunes on Trade,” a Friday evening concert series that brings in hundreds of music enthusiasts. Visitors also come to many other downtown festivals, including Family Fest, Oktoberfest, Chili Cook Off, and Wing Fling. The City’s event staff keeps the City Park the center of recreation in town, planning concerts, providing an amphitheater for public concerts and ceremonies, a children’s play area, walking trails, a picnic shelter, a pond, and much more. The town is also home to the BMW manufacturing plant, as well as the longtime home of the North American Headquarters for Michelin North America and Mitsubishi Polyester Inc.
For more information about, Click here! If you want more information on our work doing landscaping in Greer, visit this page again soon! A new homeowner had replaced some unattractive spaces on her front yard with spacers where plants and flowers could be placed, but the homeowner realized that he was much better at construction and demolition than having a green thumb, because the plants and flowers quickly died. He asked a few of his neighbors who he should call for Greer landscape services and they all said Cochran Landscape. The homeowner called us and was pleased with what we could offer and, of course the end result. The Cochran Landscape team arrived at the Greer residence and the homeowner showed us his current landscaping. He said he wanted to make the landscaping attractive, but also easy to manage. We gave the homeowner a variety of options with plants, flowers, and outdoor lighting that would be an added curb appeal to his new home purchase. The customer selected what he wanted done, then scheduled our team to return first thing the following morning, which they did. The crew went to work beautifying the landscaping by adding colorful plants and flowers, then we added outdoor lighting around a few of the plants and the walkway. The homeowner watched in delight, then we our team was finished the customer said it looked outstanding. We let the homeowner know that we could keep his landscaping beautiful year round with just a little maintenance and he happily agreed. The customer said he is really impressed with the landscape Greer homeowners would be proud of, thanks to Cochran Landscape.